By Keith Cowing on December 29, 2015 8:57 PM. "A Washington brawl has broken out over the future of the U.S. military's ability to reach orbit, with the powerhouse combo of Boeing and Lockheed Martin jostling with the scrappy yet well-funded upstart of entrepreneur Elon Musk's SpaceX for multibillion-dollar contracts for launching satellites. The competition is upending the norms of the defense contractor heavyweights, who are not used to dealing with relatively fresh rivals, and has released a flood of lobbying cash. SpaceX has spent more than $1.3 million on lobbying this year and while the Boeing-Lockheed joint effort, called United Launch Alliance, spent more than $900,000 both on pace to easily set new records for the companies once the final quarter of 2015 is reported." By Keith Cowing on December 28, 2015 7:02 PM. "Spend any time around NASA public affairs specialists, as I do, and you'll eventually get the eye roll. It comes when someone inquires about aliens or faked moon landings or all manner of other nonsense. One of the more recent eye-rollers originated in Russia, where officials said sea plankton was growing on the exterior of the International Space Station. (It wasn't.) "If you think that's bad, you should Google 'NASA hiding,'" one space agency official told me. So I didand here are the first five things I found." Keith's note: Of course NASA does not help itself with the conspiracy crowd when it funds quackery such as the warp drive project at JSC and the LENR project at LaRC - both of which defy conventional physics, have yet to yield any reproducible results, and for which NASA is not even willing to reveal budgets or objectives. By Keith Cowing on December 28, 2015 3:50 PM. "Ever since the 1980s, researchers have been working on the development of a quantum computer that would be exponentially more powerful than any of the digital computers that exist today. And now Google, in collaboration with NASA, says it has a quantum computer the D-Wave 2X that actually works. Google claims the D-Wave 2X is 100 million times faster than any of today's machines. As a result, this quantum computer could theoretically complete calculations within seconds to a problem that might take a digital computer 10,000 years to calculate. That's particularly important, given the difficult tasks that today's computers are called upon to complete and the staggering amount of data they are called upon to process. On the surface, the D-Wave 2X represents not just a quantum leap for computing, but also for the field of artificial intelligence. In fact, Google refers to its work being carried out at NASA's Ames Research Center as "quantum artificial intelligence." That's because machine learning problems that today are too hard or too complex for computers could be solved almost instantaneously in the future." "Arguably, the open source movement the idea that a group of technologists freely contributing their own work and commenting on the work of others, can create a final product that is comparable with anything that a commercial enterprise might create has been one of the great innovation catalysts of the technology industry. It's no wonder, then, that a group of Silicon Valley luminaries including Elon Musk, Peter Thiel and Reid Hoffman have lined up to contribute $1 billion to a new open-source AI project known as OpenAI that is led by Ilya Sutskever, one of the world's top experts in machine learning. If you can open-source software and hardware, then why not open-source artificial intelligence, right?" By Keith Cowing on December 23, 2015 8:11 PM. "ULA has ordered additional Atlas engines to serve our existing and potential civil and commercial launch customers until a new American-made engine can be developed and certified. While ULA strongly believes now is the right time to move to an American engine solution for the future, it is also critical to ensure a smooth transition to that engine and to preserve healthy competition in the launch industry." "We thank Senator Shelby for his leadership in the Senate, for securing our nation's defense, ensuring America stays on the technological forefront in space, and for keeping important, valuable jobs in North Alabama." By Keith Cowing on December 22, 2015 5:28 PM. Keith's 10:15 am note: NASA sources report that NASA SMD has decided to cancel the launch of Mars InSight in 2016 due to problems with the French seismometer. There is a design flaw in the instrument - one that prevents it from being able to maintain the vacuum needed to operate on the surface of Mars - or for that capability to be adequately tested prior to launch so as to assure that the instrument will operate. Without being able to certify that this instrument works there is not much point in launching. CNES has been trying to get this instrument to work for most of 2015 to no avail. NASA is not pleased. "After thorough examination, NASA managers have decided to call off the planned March 2016 launch of the Interior Exploration using Seismic Investigations Geodesy and Heat Transport (InSight) mission. The decision follows unsuccessful attempts to repair a leak in a section of the prime instrument in the science payload." "We're all just pretty disappointed right now. Devastated would be a better word," says Lisa Pratt, a biogeochemist at Indiana University in Bloomington and chairwoman of a Mars advisory committee for NASA. "Everyone has been waiting to get a seismic instrument on Mars after Viking." "NASA chose InSight over two other finalists in the Discovery class, a competition of planetary missions costing no more than US$425 million: a boat that would have sailed on the lakes of Titan, and a probe that would have hopped repeatedly across the surface of a comet's nucleus. InSight's delay may change scheduling of other NASA missions, says Elkins-Tanton, who leads one mission proposal, to the metallic asteroid Psyche, which is competing to be the Discovery mission to launch in the series after InSight." By Keith Cowing on December 22, 2015 12:24 PM. "... the FAA is announcing the availability of a FONSI, based on the analysis and findings of the U.S. Air Force's (USAF's) December 2014 Environmental Assessment for the Space Exploration Technologies Vertical Landing of the Falcon Vehicle and Construction at Launch Complex 13 at Cape Canaveral Air Force Station Florida (EA). 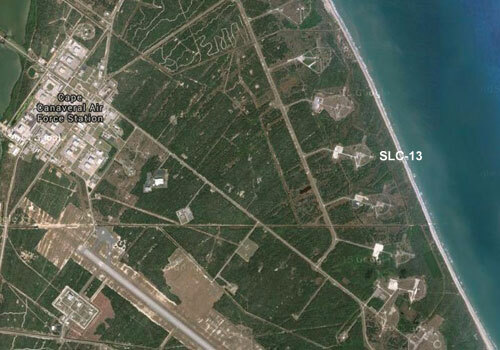 Subsequent to the USAF issuing the EA, Launch Complex-13 was renamed to Landing Complex-1 (LC-1)." What If We Used Reusable Falcon Heavys To Go To Mars? By Keith Cowing on December 22, 2015 12:17 AM. Trying to picture what it would cost to use reusable Falcon rockets to send humans to Mars Vs multiple SLS rockets at $1billion+ each. By Keith Cowing on December 21, 2015 10:10 PM. "On Monday, SpaceX's first flight since its Falcon 9 rocket blew up in June, Musk topped his fellow tech billionaire and space rival [Jeff Bezos], by landing a larger, more powerful rocket designed to send payloads to orbit, and not just past the boundary of what's considered space. It was a much more complicated feat that was celebrated as another leap forward for Musk and his merry band of rocketeers." "A few weeks ago, Jeff Bezos inaugurated his Twitter account with the surprise announcement that his space company, Blue Origin, had launched and landed a rocket after suborbital flight. But SpaceX managed to deliver 11 satellites to orbit, which requires an order of magnitude more thrust, and land its rocket. SpaceX's booster is coming a hell of lot faster, and its landing much trickier. So Elon Musk's got this one. (For now.)" By Keith Cowing on December 21, 2015 8:46 PM. "SpaceX made space exploration history tonight when it brought a Falcon 9 first stage back to a safe landing on Earth. Minutes after ending its portion of the launch, the first stage reoriented itself, fired its engines, and came in for a pinpoint landing at Cape Canaveral. Meanwhile the Falcon 9's second stage continued into space eventually deploying its entire 11 satellite ORBCOMM payload successfully." Musk:" its like having an aircraft that can be used multiple times when all other aircraft int he world can only be used once". Musk: "I think that this is a revolutionary moment - no one has ever brought an orbital class booster back intact"
Musk "I still can't quite believe it"
Musk doing media telecon now - "sonic boom of landing reached me as it landed - for a moment I thought it exploded!" By Marc Boucher on December 21, 2015 12:23 PM. Marc's note: SpaceX will attempt their return to flight Sunday evening with the launch of ORBCOMM-2 mission from SLC-40, Cape Canaveral Air Force Station. This follows the successful static fire test on Friday. Of note, SpaceX may attempt landing of the Falcon 9 rockets first stage at Space Launch Complex 13. Update: You can watch the launch live on SpaceRef on the SpaceX channel starting at 8:00 p.m. ET (0100 GMT). Marc's Update: The launch has been delayed 24 hours as there will be more favourable conditions for a landing attempt tomorrow. The new launch window is between time is 8:29 - 8:34 p.m. ET. Continue reading SpaceX Return to Flight Scheduled for Monday. By Marc Boucher on December 21, 2015 7:49 AM. "The International Space Station Mission Management Team met Sunday and gave its approval to proceed with a spacewalk Monday out of the Quest airlock by Expedition 46 Commander Scott Kelly and Flight Engineer Tim Kopra of NASA to assist in moving the Mobile Transporter rail car a few inches to a worksite on the station's truss where it can be latched in place and electrically mated to the complex. The green light for the unplanned spacewalk to take place Monday came three days after the Mobile Transporter stalled just four inches away from its embarkation point at worksite 4 near the center of the station's truss as it began to move to another worksite to support robotic payload operations with its attached Canadarm2 robotic arm and the Special Purpose Dexterous Manipulator (Dextre)." Marc's note: Watch it live. Marc's update: The mobile transporter rail car was successfully moved and is in place for the Progress 62 cargo resupply spacecraft arrival scheduled for Wednesday. By Marc Boucher on December 18, 2015 5:05 PM. "This is the third in a series of four guaranteed orders NASA will make under the Commercial Crew Transportation Capability (CCtCap) contracts. Boeing and SpaceX received their first orders in May and November, respectively, and have started planning for, building and procuring the necessary hardware and assets to carry out their first missions for the agency. NASA will identify at a later time which company will fly a mission to the station first. Boeing met the criteria for NASA to award the company its second mission with the successful completion of interim developmental milestones and internal design reviews for its Starliner spacecraft, United Launch Alliance Atlas V rocket and associated ground system." "Expedition 46 Commander Scott Kelly and Flight Engineer Tim Kopra of NASA are preparing for a previously unscheduled spacewalk outside the International Space Station on either Monday, Dec. 21, or Tuesday, Dec. 22. The pair will move the station's mobile transporter rail car so it can be latched in place ahead of the Wednesday, Dec. 23 docking of a Russian cargo resupply spacecraft. The mobile transporter -- used to position the station's robotic Canadarm2 -- stalled on Dec. 16, just four inches (10 centimeters) from where it began its move, while flight controllers in the Mission Control Center at NASA's Johnson Space Center in Houston were attempting to reposition it robotically. The cause of the stall still is being evaluated." By Marc Boucher on December 18, 2015 10:41 AM. "NASA's Lunar Reconnaissance Orbiter (LRO) recently captured a unique view of Earth from the spacecraft's vantage point in orbit around the moon." Marc's note: The ASU website has more details on how the image was taken along with some video. Well worth visiting. By Keith Cowing on December 17, 2015 9:04 PM. "Sen. Richard Shelby loaded up the $1.1 trillion spending bill with pet provisions, including one measure worth hundreds of millions to a rocket manufacturer with operations in his home state. The cagey lawmaker also fought hard for language protecting red snapper fisheries on Alabama's Gulf Coast, even issuing a press release bragging about his efforts. "That is why I fought tirelessly for several provisions to be included in the omnibus appropriations bill that I believe will help respond to the serious challenges facing anyone who wants to fish for red snapper in the Gulf," Shelby said in the release. But in an only-in-Congress twist, Shelby, a very senior member on the appropriations committee, still plans to vote against the sprawling omnibus package. He's citing the lack of language to restrict Syrian refugees as the reason." "The Arizona Republican is furious with Sen. Richard Shelby (R-Ala.) for tucking a provision into the massive 2,000-page bill that allows defense contractor United Launch Alliance to keep buying Russian rocket engines reversing language McCain championed in the National Defense Authorization Act that limited ULA to purchasing nine rocket engines." ... But McCain has accused ULA of manufacturing a crisis to get the law changed by not bidding on the first military satellite launch. On the Senate floor Wednesday, he vowed to take up the issue again in next year's defense authorization bill threatening a "complete and indefinite" ban on Russian-made engines." By Keith Cowing on December 17, 2015 2:40 PM. "JWST continues to meet its cost commitments, but unreliable contractor performance data may pose a risk to project management. To help manage the project and account for new risks, project officials conducted a cost risk analysis of the prime contract. ... GAO found that while NASA's cost risk analysis substantially met best practices for cost estimating, officials do not plan to periodically update it. ... Further, the project does not have an independent surveillance mechanism, such as the Defense Contract Management Agency, to help ensure data anomalies are corrected by the contractor before being incorporated into larger cost analyses, as GAO recommended in 2012. As a result, the project is relying partially on unreliable information to inform its decision making and overall cost status." "The JWST is a joint project of NASA, ESA and the Canadian Space Agency. Europe's contribution includes the Ariane 5 launch, along with two of the four state-of-the-art science instruments optimized for infrared observation of the Universe, and support for scientific operations." By Keith Cowing on December 17, 2015 12:38 AM. Keith's note: NASA's R5 robot can't complete any of the tasks it was designed to do and placed last in DARPA's challenge in 2013. So NASA sent the robot to two universities in 2015 to see if some students could fix it. NASA refuses to tell you how much this robot cost, why it was developed, or how it works. But before they sent their broken droids off to college for repairs they decided that R5 was good for one thing: dancing in music videos - just in time for Star Wars. Is this what NASA calls "dancing"? This looks more like a slow motion mime with stiff joints. The video's caption says "NASA's latest robotic addition had been created to "perform in extreme environments." The space agency is investing in robotics for deep space exploration and Valkyrie will compete in their Space Robotics Challenge in 2016." Oh boy - a robot dance off. I can't wait. By Keith Cowing on December 16, 2015 11:48 PM. Keith's note: This 2006 video "Reach" by Karen Lau is my number one favorite thing NASA has ever done for education and public outreach. I try and feature it once a year. The actor in the video is probably 12 years old now. Yet we're no closer to going back to the Moon - or on to Mars on the cusp of 2016 than we were in 2006. I grew up in the 1960s being told that we'd land on the Moon "by the end of this decade". We did. Then I was told by NASA that we'd be on Mars by 1981. Sure, why not. Now in 2015, nearly 50 years after my younger self was promised Mars by 1981 Charlie Bolden gets excited when he says "we're less than 20 years away from going to Mars". Had NASA kept its original promise I'd have been 26 when we landed humans on Mars. Now, if NASA does it by 2035 I'll be 80. If. This is not progress, NASA. Its an embarrassment. And its your fault. By Keith Cowing on December 16, 2015 3:29 PM. "It's interesting that this is at the very time that in our culture here on earth, the movie that's hearkening back, "Star Wars," is coming out again and it's to be such a blockbuster at the box office. Well, what is fictional in "Star Trek" and "Star Wars" is now becoming factual. And in large part is what has been done in the nation's space program since the shutdown of the space shuttle back in 2011 and in the preparation, the new vehicles, the new rockets, the new spacecraft, the new satellites, the new exploratory missions that have gone on." "This bill funds NASA at $19.285 billion in FY 2016, an increase of $1.3 billion above FY 2015. Within the NASA portfolio, the bill fully funds the Commercial Crew Program to enable the United States to achieve safe, reliable, and independent human access to the International Space Station by 2017." "Congress reached agreement on a FY2016 appropriations bill overnight. NASA will get $19.285 billion, $785 million more than the President's request and $1.285 billion more than FY2015. Among the big winners are planetary science, the exploration program (including the Space Launch System and Orion), and commercial crew. The commercial crew program is funded at the requested level of $1.244 billion, a win for the Obama Administration." By Keith Cowing on December 16, 2015 10:37 AM. "As I learned in the Marine Corps and Kathy learned in the reserves, we have core values," said NASA Administrator Charles F. Bolden, Jr., who flew with her on two space missions, including one that deployed the Hubble Space Telescope. "They're not challenging a bureaucrat or a traditional political appointee," Bolden said of Republicans in Congress. "They're challenging a scientist. They just picked the wrong person." Just shy of two years into the job, Sullivan, 64, has been drawn into a lingering and passionate skepticism among some congressional Republicans of the mainstream scientific consensus that man-made pollution is behind the planet's recent warming." By Keith Cowing on December 15, 2015 12:30 PM. "We found deficiencies in NASA's management processes and controls that may limit the usefulness of the Agency's efforts to better manage its space technology investments. First, although NASA has revised its technology roadmaps to provide additional information regarding how specific technologies will help meet Agency mission objectives, it needs to complete the ongoing revision of its Strategic Space Technology Investment Plan to provide the necessary detail to determine the projects that best support Agency priorities. Second, the information in TechPort remains incomplete and inaccurate, impairing the value of the database as a tool to manage and share information about NASA's space technology portfolio. For example, we selected a sample of 49 active projects and found the database contained no information for 16 (33 percent) of the projects." By Keith Cowing on December 15, 2015 12:26 AM. Keith's note: There is a NASA-sponsored event called #BioSpaceBigThink underway. According to @Astro_Cady "It's all about the future. Spent my 55th birthday kicking off #BioSpaceBigThink for #JourneyToMars for @NASA!" OK, so what is she so exited about? There is nothing online at NASA.gov's calendar about this event - how to attend, what the program is and how it has anything to do with #JourneyToMars except that it has a picture of Mars and an astronaut in attendance. This event is apparently being run by @secondmuse which claims to be an "innovation agency" (whatever that is). SecondMuse runs the somewhat mysterious launch.org thing (a White House pet project of sorts) - so maybe that's the connection. I have asked about NASA and Launch.org before but the CIO office never responds. There is a NASA logo on this #BioSpaceBigThink event so one would assume NASA is paying for it (they pay NASA staff to do launch.org stuff). This #BioSpaceBigThink crowd is the same group who did something called NASADatanauts recently which @BethBeck at NASA's CIO office organized under the radar. Again, there was no mention of that #NASADatanauts thing on NASA's calendar, no press release, agenda, etc. Truth is - these are just playtime events for the digerati and special friends of the CIO - things that have nothing to do with any established NASA strategy - nor do they ever produce a deliverable - tangible or otherwise - such that they can have an impact on the rest of the country. 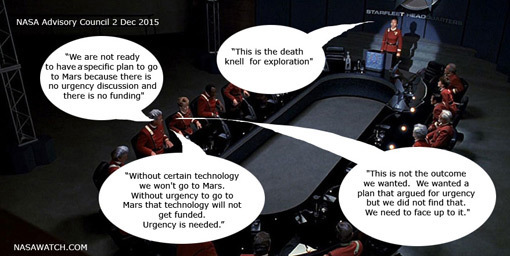 But its all about #JourneyToMars, right? - so its OK.
By Keith Cowing on December 14, 2015 6:06 PM. "The Center for the Advancement of Science in Space (CASIS) and the National Science Foundation (NSF) today announced a joint solicitation wherein researchers from the fluid dynamics community will have the ability to leverage resources onboard the International Space Station (ISS) U.S. National Laboratory. Up to $1.8 million will be awarded for multiple research investigations to support flight projects to the ISS National Laboratory. Through this partnership, CASIS will facilitate hardware implementation and on-orbit access to the ISS National Laboratory. NSF will fund the selected projects to advance fundamental science and engineering knowledge. CASIS is the nonprofit organization responsible for managing and promoting research onboard the ISS National Laboratory. NSF supports transformative research to help drive the U.S. economy, enhance national security and maintain America's position as a global leader in innovation." Keith's note: First and foremost, this is good news - and interesting since NSF (another government agency) is putting money into ISS research. NSF is paying the bills here - CASIS only does the paper work. But still, new users are new users - the more the merrier. What is odd about this CASIS press release is that "NASA" is mentioned nowhere. Of course, CASIS is obsessed with their whole branding thing - but instead of building upon a world-wide brand like NASA's, they just ignore it and grasp at straws to build their own identity. More interesting (at least to me) is how a non-profit organization like CASIS can have a peer-to-peer interaction with a Federal Government agency - an agency that is on a par level with NASA - without NASA in the loop such that NASA does not even need to be mentioned. Indeed, NASA has not made any mention of this on its ISS National Labroratory website. Oddly, NSF makes no mention of this on their news page either. It is interesting news when another government agency signs on to the ISS. NASA's overt omission points to dysfunction on both sides of the NASA/CASIS relationship. By Keith Cowing on December 14, 2015 4:53 PM. Gee, all I wanted to know was how many organization submitted proposals and NASA refused to tell me that simple number. What now had me wondering was why NASA was so shy about providing such a simple answer. I did not ask who had applied, simply how many universities had applied. Hmmm ... could it be that only two universities applied? If so, how did it happen that they knew to apply? Did NASA drop hints to potential submitters? Do recall that the R-5 robot has been somewhat of a failure and JSC would just love to pull something successful out of this mess. R-5 is not the droid you were looking for. Developed in secrecy by NASA JSC, R-5 competed in the DARPA Robotics Challenge Trials 2013 and tied for dead last. Indeed, the R-5 was not even able to get out of its own way in some portions of the competition. NASA never really explained what this robot was for or why it developed it to have a female shape and form. After a period of silence, NASA decided in 2015 to haul out their failed R-5 droids out of storage and see if anyone could fix them. Since NASA could not/would not fix them, why not ask if others can help? Not a bad idea. So they asked universities to help them fix the broken robots. When the two university teams were announced (no doubt highly capable). I wondered how many others had applied and what the interest was in this sort of thing on a national level I was also interested in how hard NASA had worked to actually find the best teams. Mostly I was interested in the number - so I asked PAO. And I got the odd non-response response that PAO provided me. Continue reading NASA JSC's Failed R-5 Robot Project Refuses To Explain Itself. By Marc Boucher on December 14, 2015 10:01 AM. "Because of the growth and demand for small satellites, the Canadian Space Commerce Association decided earlier this year to host its first Canadian SmallSat Symposium this coming February 2nd and 3rd. The symposium is about opportunity, building capability and international partnerships." Marc's note: I'm organizing this event. We've got some great speakers announced with more to come. We have Greg Wyler opening the symposium, Pete Worden keynoting a lunch and the President of the Canadian Space Agency delivering a plenary to just name a few people. Oh, and of course we'll have some speakers from NASA. If the small satellite segment is your thing then why not come? There's still a few days to submit an abstract to speak and early registration is underway until December 23rd. We've also set aside a Business to Business room for those who want to talk business. SpaceRef/NASA Watch is the media sponsor for the event, though there will be other media present. By Keith Cowing on December 13, 2015 12:01 PM. Keith's note: There is no mention of this amazing photo (or many other stunning photos) to be found at this NASA.gov ISS gallery page or at Scott Kelly's Flickr, NASA2Explore Flickr, NASA_JSC_Photo Flickr, NASA Earth Observatory Flickr, etc. No higher resolution version, no mention of what part of Earth's surface is shown, when it was taken, etc. To be certain having crew members tweet things from orbit to 13.5 million people is great - but so many chances to vastly enhance this reach are missed every day. Yes, I am complaining about the way NASA sends pictures from space (more or less directly) to my iPhone many times a day. NASA could be spreading this magic elsewhere so very easily. By Keith Cowing on December 12, 2015 1:01 AM. "Parazynski just seems to be wired differently than many of us. His pursuit of extreme environments seems to know no bounds. In addition to being an astronaut (who has completed five space shuttle missions, seven space walks and spent 57 days in space), Parazynski is also a medical doctor, scuba diver, pilot, speaker and mountain climber he's the only astronaut to summit Mount Everest. He gives his parents and some key life events credit for his adventurous spirit. "It's hardwired in my blood," he says." By Keith Cowing on December 12, 2015 12:06 AM. "Editor Keith Cowing of NASAWatch.com says similar exercises have been done in the past, but you always knew at the end of the day you were going to get in your car and go home. It's different now. "You know that, in the back of your mind," Cowing says, "but if you're in the middle of a polar desert, you're being stressed by that environment, and how you react is going to show how you might react to a similar situation on Mars." A trip to Mars would take two years, possibly as many as three. It's important for scientists to find out whether a man or woman can deal with the stress of isolation for that long. They also have to be able to fix things. "How do you select people who are one part Captain Kirk, one part Spock and one part Scotty? I mean," he says, "that's what you're really looking for." Keith's note: in my interview the "similar exercises" that I was referring to are things done onsite at NASA JSC or at IBMP in Moscow(500 day simulated Mars missions) i.e. facilities where the real world was just outside a door. You can never totally remove that knowledge from the mind of an experimental participant. Speaking from personal experience during month-long stays on Devon Island and at Everest Base Camp, when you are actually in a place where you are profoundly aware of just how utterly isolated - and at risk - you are, you do things differently. And you are forced by that isolation/risk to be creative in how you solve problems - especially those you did not anticipate. There's no 911 to dial (easily) and no Home Depot nearby. Its in these expeditionary or so-called "planetary analog" environments that the human - and technological - factor are truly tested. NASA needs to be doing much more of the planetary analog work that ESA is so supportive of in Antarctica if it wants the whole #JourneyToMars thing to actually happen. By Keith Cowing on December 11, 2015 11:55 AM. "In a statement last month, ULA said "it wants nothing more to compete," but was prevented from doing so because of the lack of engines, and because it could not comply with the accounting structures required under the contract. It also said that the Air Force used a procurement process that would give a lot of weight to the prices companies bid and not their experience and past performance, which could have given ULA an edge. But McCain said the assertion that it's a "low-price" contract "is erroneous." Rather the contract is a "best value" source selection that calls for "a careful evaluation of performance, launch operations, schedule and price," he wrote." "Turns out Tory Bruno wasn't just whistling Dixie. At a hearing before the U.S. House Armed Services Committee in March, United Launch Alliance CEO Salvatore "Tory" Bruno issued an ultimatum: Congress must either lift its ban on the purchase of new RD-180 Russian rocket motors for use in America's space program or resign itself to letting one single space provider dictate prices to the government on all future satellite launches. Turns out, it's going to be Door No. 2." "McCain, whom President Barack Obama defeated in the 2008 presidential election, also called for a report on whether ULA's decision to use its dwindling supply of Russian-made rocket engines on non-military launches was an attempt to "subvert" the will of Congress." By Keith Cowing on December 11, 2015 10:47 AM. "Expedition 45 Flight Engineer Kjell Lindgren of NASA is among three crew members who returned to Earth Friday after a 141-day mission aboard the International Space Station, landing in Kazakhstan at approximately 8:12 a.m. EST (7:12 p.m. Kazakhstan time). Also returning were Flight Engineers Oleg Kononenko of Roscosmos (Russian Federal Space Agency) and Kimiya Yui of the Japan Aerospace Exploration Agency (JAXA). The crew touched down northeast of the remote town of Dzhezkazgan in Kazakhstan, marking the first crew landing to occur after sunset and only the sixth nighttime Soyuz spacecraft return from the space station." By Keith Cowing on December 10, 2015 8:26 PM. 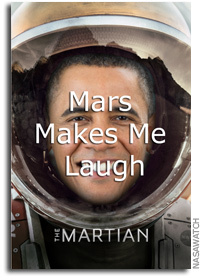 "The movie Barack most enjoyed this year was The Martian, starring Matt Damon ..."
"... Thursday's nods for Matt Damon as best actor and "The Martian" as best picture in its comedy/musical categories are hilarious. After 2015's Globes "comedy" nominee "Birdman" went on to a Best Picture victory at the Oscars (beating the Globes' dramatic best picture winner "Boyhood"), the studios have doubled down on their efforts to gerrymander films into the less competitive comedy categories for best picture and acting awards." "NASA has collaborated on this film with 20th Century Fox Entertainment, providing guidance on production design and technical consultants..."
By Keith Cowing on December 10, 2015 8:07 PM. "The money taken from Glenn would help pay for a different priority of some Senate members: a Maryland-based robotic mission to refuel and service long-orbiting satellites that otherwise might have to be shut off. Hundreds of satellites orbit the earth to provide observation and weather tracking but were not designed for servicing. If they could operate longer, they could save future replacement and launch costs, NASA says. The proposed $150 million taken from other NASA programs would focus first on keeping the Landsat 7 satellite, launched in 1999 to provide imaging of the earth for a variety of government and commercial purposes, going. Otherwise, the Landsat 7 could reach the end of its useful life in 2019. The robotic program to prolong the life of satellites has been dubbed "Restore-L Pathfinder," and is based at NASA's Goddard Space Flight Center in Maryland." By Keith Cowing on December 9, 2015 3:38 PM. "The Orbital ATK Cygnus cargo ship was bolted into place on the International Space Station's Earth-facing port of the Unity module at 9:26 a.m. EST. Cygnus is the first cargo ship to be berthed to the Earth-facing port on the Unity module." By Keith Cowing on December 9, 2015 3:28 PM. "Bright spots seen by NASA's Dawn spacecraft on the surface of dwarf planet Ceres are likely salt deposits, a paper published Dec. 9 in Nature says. Ceres has more than 130 bright areas, and most of them are associated with impact craters. Observations from Dawn's Framing Camera suggest the occurrence of salts originating from Ceres' interior. These salts are consistent with a type called magnesium sulfate." By Keith Cowing on December 9, 2015 3:27 PM. "The nail-biting maneuver that sent Japan's Akatsuki spacecraft into orbit around Venus this week is being celebrated by NASA scientists, eager to learn more about the atmosphere and climate of Earth's enigmatic sister planet. At about 7 p.m. EST on Sunday, Dec. 6, the Institute of Space and Astronautical Science (ISAS) of the Japan Aerospace Exploration Agency (JAXA) commanded the climate orbiter to fire four thrusters, aimed at nudging the spacecraft into orbit around Venus. About a half hour later, JAXA/ISAS announced that the small probe had successfully achieved an elliptical orbit around Venus." By Keith Cowing on December 9, 2015 3:25 PM. "NASA's Cassini spacecraft spied details on the pockmarked surface of Saturn's moon Prometheus (86 kilometers, or 53 miles across) during a moderately close flyby on Dec. 6, 2015. This view looks towards the anti-Saturn side of Prometheus. North on Prometheus is up. The image was taken in visible light with the Cassini spacecraft narrow-angle camera." By Keith Cowing on December 8, 2015 11:01 AM. "If the U.S. space resources law were about claiming territory, or an assertion of sovereignty or appropriation of "celestial land," there would be a case for opponents to invoke Article II that prohibits such actions. But it isn't; the U.S. law is simply about confirming and codifying the rights for U.S. private citizens/companies to peacefully explore, extract and own resources extracted, just like the U.S. and Soviet governments did back in the 1960s and 1970s, and just like China, India and other countries intend to do in the coming years through government and private missions." "Even some people within the U.S. government have raised questions about the law. "I'm not sure that the U.S. Congress can pass a law that authorizes American citizens to go do something" like claim rights to space resources, NASA Administrator Charles Bolden said at a Dec. 1 meeting of the NASA Advisory Council at the Johnson Space Center, when asked by a council member about the new law." 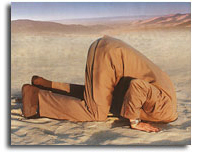 Keith's note: NASA is trying to un-spin Bolden's comments - but this is not a gaff. He has said this to others before. He does not understand/and or agree with the concepts involved, what Congress supported, and what his boss signed into law. By Keith Cowing on December 6, 2015 5:10 PM. "A United Launch Alliance (ULA) Atlas V rocket carrying the OA-4 Cygnus resupply spacecraft to the International Space Station lifted off from Space Launch Complex-41 Dec. 6 at 4:44 p.m. EST. The mission, flown for Orbital ATK under NASA's Commercial Resupply Services contract, marks the first time the Cygnus has flown on an Atlas V rocket. This was ULA's 12th launch in 2015. At just over 8 tons, Cygnus is the heaviest payload to launch atop an Atlas V rocket." @StationCDRKelly Day 254. We got our candle lit. #HappyHanukkah and #GoodNight from @Space_Station! By Keith Cowing on December 4, 2015 11:10 PM. Keith's note: On 10 January 2008 Sir Edmund Hillary, one of two humans to first stand atop Mt. Everest died. I sent Alan Stern, then AA for NASA's Science Mission Directorate an email: "I hope you name a new, large feature on Mercury after Edmund Hillary - and Tenzing Norgay..." Stern promptly sent an email to MESSENGER PI Sean Solomon saying "Sean-As you may have seen in the past few hours, Sir Edmund Hillary died today. Let's name prominent features for him and Tenzing Norgay on Mercury. It's ALL about exploration." Solomon concurred. Eventually it became clear that the IAU only wanted to name things on Mercury after painters for some unexplained reason. Flash forward to July 2015 - mountain ranges on Pluto have been provisionally named "Hillary Montes" and "Norgay Montes". According to the Washington Post "For many years, we referred to Pluto as the Everest of planetary exploration," New Horizons Principal Investigator Alan Stern said in a statement. "It's fitting that the two climbers who first summited Earth's highest mountain, Edmund Hillary and Tenzing Norgay, now have their names on this new Everest." I hope the names stick. That said, who first suggested it to Stern? Just sayin'. By Keith Cowing on December 3, 2015 4:33 PM. Keith's 3 Dec 10:33 am ET note: Consideration is being given to delaying the launch of NASA's Mars InSight lander mission. The problem has to do with the French seismometer. There is a persistent leak inside the seismometer that has been hard to fix. Given that this payload is one of the two prime functions of InSight if the issue is not resolved in the next month or so then the launch will be slipped until the next favorable Mars launch window opens. I am awaiting a formal statement from NASA PAO. "A key science instrument that will be carried aboard NASA's Interior Exploration Using Seismic Investigations, Geodesy and Heat Transport (InSight) spacecraft being prepared for launch in March 2016 is experiencing a leak in the vacuum container carrying its main sensors. The sensors are part of an instrument called the Seismic Experiment for Interior Structure (SEIS), which is provided by the French Space Agency (CNES)." "Technicians have detected a small leak in the vacuum-sealed sphere that holds the instrument's three seismometers, NASAWatch reported and NASA confirmed on 3 December. The leak must be fixed for the mission to accomplish its science goals. CNES engineers are working to repair it before shipping the instrument to the Vandenberg Air Force Base in California to be installed in the spacecraft and tested." By Keith Cowing on December 3, 2015 2:01 PM. "Virgin Galactic has introduced a 747 to its fleet of vehicles as part of a technical update on its LauncherOne small satellite launch service. The 747-400 commercial jet aircraft, previously operated by Virgin Atlantic under the nickname 'Cosmic Girl,' will provide a dedicated launch platform for the LauncherOne orbital vehicle." By Keith Cowing on December 3, 2015 11:58 AM. NAC member @MilesObrien "When it comes to engaging the public timidity and being circumspect about the plan is not going to carry the day"
By Keith Cowing on December 2, 2015 9:48 PM. "Hawaii's supreme court has ruled that the construction permit for the Thirty Meter Telescope (TMT) atop the mountain of Mauna Kea is invalid. The 2 December decision is a major blow to the international consortium backing the US$1.5-billion telescope, and a win for the Native Hawaiians who have protested its construction on what they regard as a sacred summit. Hawaii's Board of Land and Natural Resources should not have approved the permit in 2011, the court said, because it did so before protestors could air their side in a contested case hearing. "Quite simply, the Board put the cart before the horse when it issued the permit," the court decision reads. "Accordingly, the permit cannot stand." It is unclear whether and how the TMT will move forward given the new ruling." By Keith Cowing on December 1, 2015 10:10 PM. "On the Monday before Thanksgiving NASA made what it deemed a momentous announcement: the space agency had awarded $1.16 billion to Aerojet Rocketdyne for rocket engines that would power its "Journey to Mars." By contrast, a few hours earlier, the private space company Blue Origin secretly launched a rocket into space and safely landed it. The contrast between the deal struck in corridors of Washington D.C. and what had happened in the desert of West Texas could not have been more stark." "Blue Origin is not the only company in hot pursuit of reusable rockets. SpaceX has come close to succeeding in two attempts to land the first stage of the Falcon 9 orbital launch vehicle on an ocean platform. In the near future, SpaceX will also attempt to touch down the first stage of the Falcon 9 on land close to the launch site. Sooner or later, SpaceX will succeed and will be nailing these landings, just like Blue Origin did. Other companies and countries are working on reusable rockets and spacecraft as well. Those working on reusable suborbital vehicles include Virgin Galactic with their SpaceShipTwo, XCOR Aerospace with their Lynx rocketplane, and Masten Space Systems with their vertical takeoff and landing rockets." Keith's note: This is not the first time in recent memory that NASA has made decisions to revisit old technology as part of bad habits it just can't shake. The agency spent over a billion dollars on J-2X and then changed its mind. Meanwhile everyone outside of NASA who is spending their own money on rocketships is striving toward reusability for economic reasons. But NASA doesn't do economical things in-house, now does it? Continue reading NAC Meeting This Week.